In 2012, Canada stopped mining and exporting asbestos. Once considered a miracle mineral for its fireproof qualities, asbestos came to be better known as a carcinogenic, hazardous material banned in numerous countries around the world. Canada was once a leading producer of asbestos and home to the world’s largest chrysotile asbestos mine, located in the Town of Asbestos in the province of Quebec. This is the subject of a new book by Professor Jessica van Horssen. A Town Called Asbestos is a thoroughly researched and thoroughly shocking account of the history of asbestos mining, environmental health, and resistance in this small, Quebec resource town. How did the people of the Town of Asbestos respond to the growth of asbestos mining, the knowledge of the harmful health effects of asbestos, and the consequence for their own bodies? On this episode of the podcast, we speak with Jessica van Horssen about her new book. Van Horssen, Jessica. 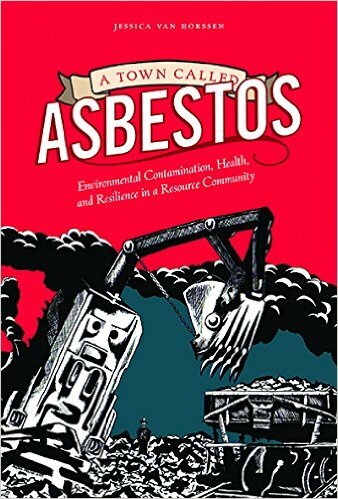 A Town Called Asbestos: Environmental Contamination, Health, and Resilience in a Resource Community. Vancouver: UBC Press, 2016. Kheraj, Sean. “Episode 55: Asbestos Mining and Environmental Health” Nature’s Past: Canadian Environmental History Podcast. 28 November 2016.